When you ask people if they prefer sweet or salty, you'll likely get a pretty even mix of answers. But ask them if they like the combination together and the chances are that most will love it. It is, no doubt, why chocolate covered salty pretzels and salted caramel sauce are such popular items. Look at any good gourmet chocolate store and there should be a row of beautiful chocolate draped bonbons with a pinch of sea salt on top. Likewise, candied or chocolate covered nuts are good but way more awesome if the nuts are salted. So, adding a salty element to sweet creamy ice cream is a sure winner. 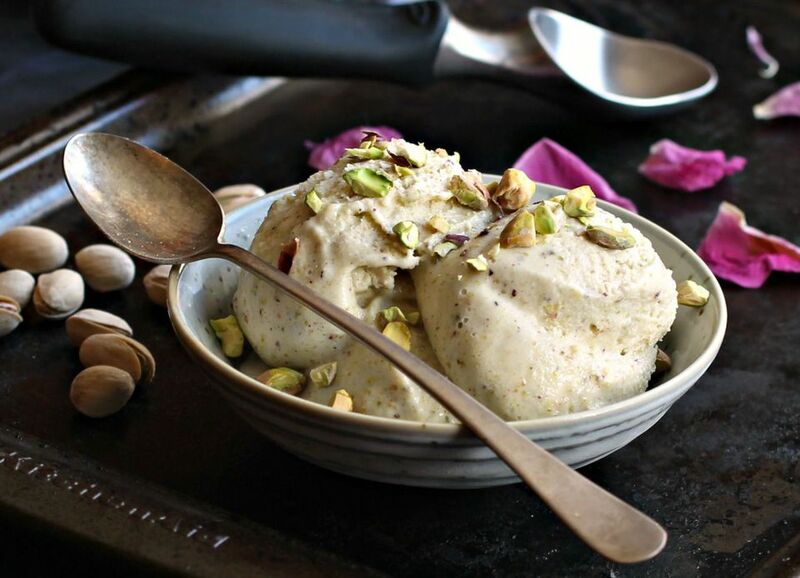 Pistachio ice cream itself is not usually salty, but mixing roasted, salted pistachio pieces into a honey-based ice cream definitely fulfills that sweet and salty craving. Making ice cream at home is not only easy but allows you to customize the flavors. In this case, adding honey to the vanilla base adds a wonderful flavor and you can mix in as few or as many of those delicious, salted pistachios as you like. There are two primary methods of making the ice cream base. One is to use a cooked custard base, which contains eggs and the other is a straight dairy only option which doesn't require cooking. This recipe uses the no-cook, straight dairy method. Note that the color of pistachios, while definitely green, is nowhere near the deep green shade you find in store-bought pistachio or even mint ice cream. You can certainly add some green food color to your ice cream if you really want that bright green shade. But the recipe doesn't include it and, instead, it keeps the natural, honey beige color but with green flecks from the bits of pistachios. This recipe is easy and simple and results in the perfect hit of sweet, salty and creamy in every bite. A perfect treat for a hot summer day. Enjoy! In a large bowl, whisk together the whole milk, heavy cream, honey, granulated sugar, vanilla, and salt. Add the roasted pistachios to a food processor and pulse a few times until the nuts are very broken down but not powder or paste. Add the crushed pistachios to the bowl. Pour the mixture into your ice cream maker and follow the manufacturer's instructions for proper use. Churn the mixture for 35 to 40 minutes, transfer to a freezer safe container and freeze for at least 4 hours before serving.